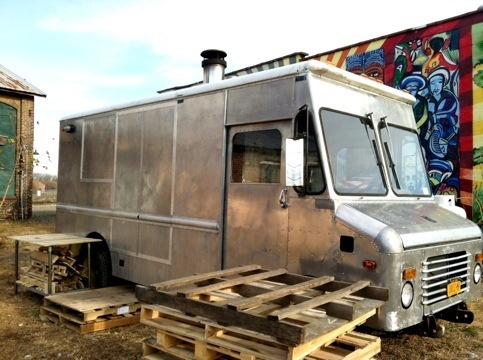 Mystery Truck with Chimney – source of pizza? This morning’s jog took me down to the South Bay, then along the Holcim roadway to 3rd St. From there I ran along the back side of LB Furniture to The Basilica. On passing the Basilica, I saw this aluminum step van rigged out with a chimney. A well placed rumormonger informs (can a rumor be information?) that this is a wood-fired organic pizza truck. The black soot around the chimney suggests that it must have been fired up and tested out. From the outside, everything seems ready to go excepting the absent front bumper. Where and when with the pizza?? BTW – watch out for the criminally high speed bumps along the LB Furniture building. I am sure that low riders like my Corolla will loose their oil pans on those things.